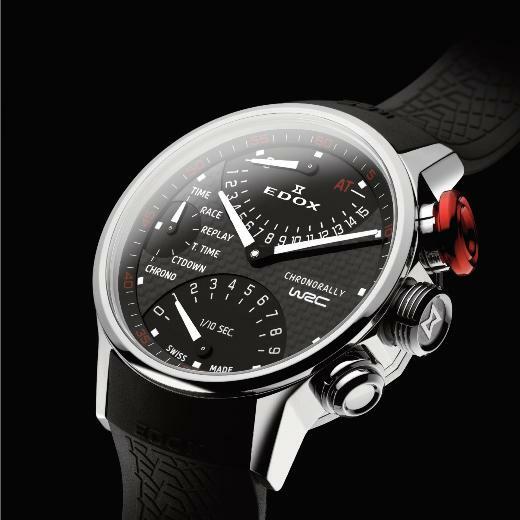 The Edox WRC Watch Collection is manifestly dedicated to rally drivers, those true virtuosos of the tarmac, snow and ice, and to all devotees of the automobile and motor-racing world. This new limited edition watch, to be displayed at Baselworld 2011, is sporty in style, masculine and very “bad boy”, with a black carbon dial and powered by a chronograph movement that is sturdy, shock-resistant and extremely reliable. At once, as in motor racing, the over-sized push-piece captures the attention, its electric green evoking the lights indicating the start of a race. Designed for World Rally Championship drivers, the watch is in ultra-light titanium, with some components finely coated in black PVD for a decidedly virile look. 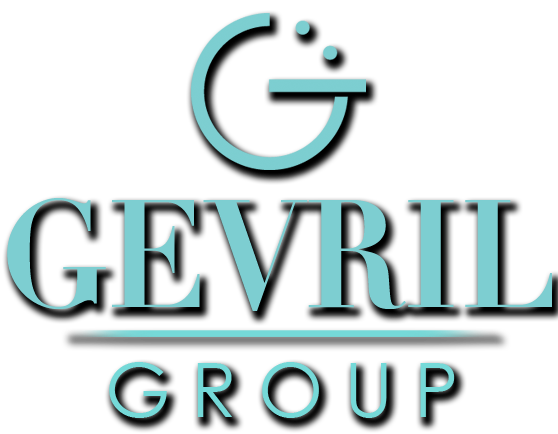 The movement, rotated through 180 degrees, makes for instinctive and enjoyable use. As ever, the WRC collection features many inspired details: wheel rims actually embossed on the case back, green, oversize push-piece in anodized aluminum and a tachometer scale on the dial for measuring objects in motion. The new Xtreme Pilot III Limited Edition is a real tool for drivers. It is limited to 1,000 exclusive pieces and comes in a personalized case. 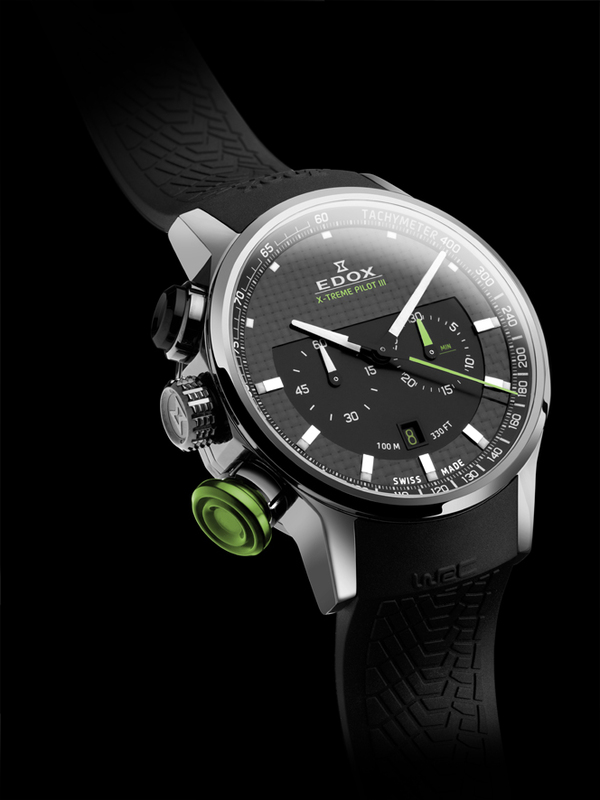 Edox has been the official time-keeper to the World Rally Championships since 2010. What rally driver has never dreamed of finally having a watch that would enable them to time their performance? Edox, a Jura, Switzerland watchmaking firm which celebrated its 125th anniversary in 2009, has now made this dream come true with a collection wholly dedicated to the WRC World Rally Championship. Developed exclusively for Edox, the new 36 calibre is a true revolution in the worlds of watchmaking and cars. The new WRC Chronograph has many functions. In addition to the standard displays, the Chronorally offers a plethora of new possibilities: stage timing with an accumulated stage time, recount/replay mode, countdown mode and chronograph. All these functions are accessible by means of the pushpieces and the crown, which, with its outsize design, permits easy access for the gloved hands of a rally driver. An instrument that is truly dedicated to the world’s best rally drivers and their co-drivers, the WRC Chronograph also boasts original car-theme details, with, for example, its raised caseback representing a wheel rim and its rubber wristband reproducing the contours of car tires. Edox has been taken on as the official timing partner for the WRC World Rally Championship for the next three years. Functions – Hours, minutes, seconds, chronograph, countdown, stage timing, accumulated stage timing, replay.